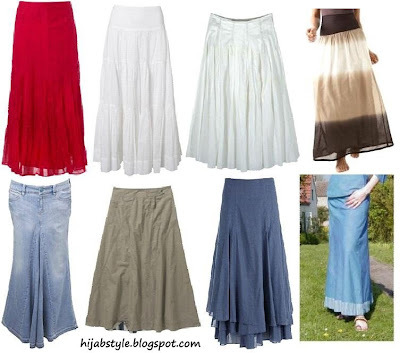 Red maxi skirt £20, Dorothy Perkins; white tiered skirt £25, BHS; crinkle cotton skirt £49, Kew; tie-dye skirt £19, Promod; denim skirt £50, Miss Selfridge; Takasu skirt £24.50, Fat Face; Flora midnight skirt £40, Monsoon; handloom cotton skirt £23.95, Get Ethical. salaams, what do u get if u combine trininny and suzannah and your blog? a muslimah version of what not to wear?! ok i think should contact islam channel, new programme on the horizon people! I love the red skirt! Eternal, it sounds like a great idea, but I'm not sure if Islam Channel would be up for it hehe..
Fatima, thanks for clearing things up! I was wondering what 'ali' was short for lol. Glad you like the skirts! And yes I looked Uttam, they have some gorgeous stuff, I'll be including them on the blog soon inshallah. The skirts are all so pretty Hayah!!! Ombre, and the second to last blue---those are my faves. I want to ask your opinion, since you are really good in Islamic fashion....is it okay if i wear this long skirt to classes? Probably I`m gonna pair it with long sleeve cotton shirt. p/s: I`m a student and just started wearing hijab last week :).